When I was asked the question recently ‘what do you do to switch off from writing?’ I realised the answer was very little! Do writers ever switch off? I’m sure I’m not alone in finding it difficult, if not impossible, to totally turn off the creative side of my brain. It’s not like a lot of jobs where you leave the house in the morning and come back in the late afternoon or evening. I’m in this house practically all day, every day. For hours and hours at a time I either sit at the desk, or shift my laptop to another room in the house (depending on how well-behaved my dogs are being and whether I need to keep an eye on them). When I’m not physically at the laptop writing – whether that is writing a novel, blog post, interview, article or email – I’m away from it thinking about writing. If it wasn’t for the dogs needing a walk, or my sons needing lifts somewhere, I’d have no reason to leave the house. But even on the rare occasions when I escape the four walls, my mind is filled with thoughts about writing: characters, questions, plot holes, ideas for twists, ideas for the next novel, blog posts I need to write – you get the picture. Although the dog-walks with my two border terriers and my sons are generally very interesting as we talk about a lot of varied topics – we always seem to come back to my most recent plot issue! Thinking more deeply about it, however, I realised that reading out of my genre helps take my mind off writing. 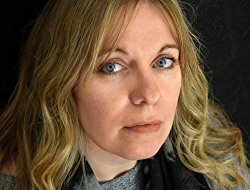 If I read psychological thrillers, or crime novels, I find my mind wandering at key points – trying to guess where the author is going to go, what the twist might be, or I might be revelling in the genius and wishing I’d thought of the idea first… but, reading something different enables my brain to shift modes. I become a reader, not a writer. And I have my local book club to thank for this. Before I became a member, the psychological and crime genre was all I read. But thanks to them, my horizons were stretched (sometimes reluctantly) and it opened me up to reading all sorts of genres. It was through the group that I read The Secret Life of Bees, by Sue Monk Kidd, one of my all-time favourite books and I know I would’ve missed out on that had I not been part of the club. Proof I get out of the house sometimes! For the most part, I feel I’ve lost valuable contact with friends as I have been so busy writing. I’ve cancelled meet-ups because I’ve felt panicked just thinking about being away from my writing for too long. My aim, therefore, is to become more organised, enabling me to regularly set aside some time to do something away from my desk, and if possible outside of the house! Thanks so much, Sam. I hope you succeed with your aim. Oh, and I loved The Secret Life of Bees too. 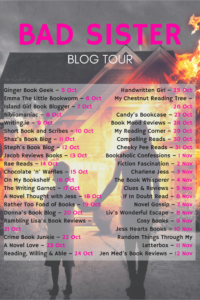 Thank you to Sabah Khan from Avon Books for the place on the blog tour. 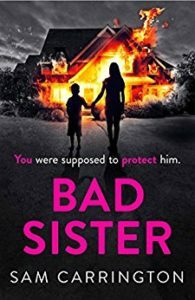 If you like the sound of Bad Sister then it’s available now in ebook and in paperback from 14th December. And do please have a look at the other blogs taking part in the tour.